Shannon is the girl behind who drinks 12 teaspoons of gasoline a day, that made it more than a total of 5 gallons in a year. 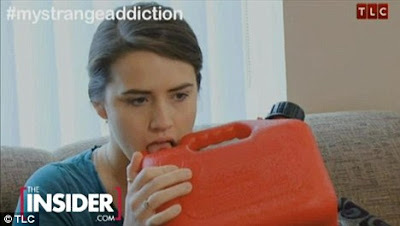 She claimed her addiction of drinking gasoline at TLC's television program #mystrangeaddiction "My Strange Addiction". Shannon said, "It tingles at first and then it, it burns the back of my throat." We all know that even smelling gasoline is a health hazard for us. But Shannon admitted her addiction from drinking gasoline and even demonstrate it, either licking the cap or drinking it straight out of the canister. She said, "Even though it hurts me, it makes me feel good." However, New York State Department of Health said, "Drinking gasoline can cause burns, vomiting, diarrhea and, in very large amounts, drowsiness or death." Comments or suggestions about "A Girl who can't stop drinking Gasoline" is important to us, you may share it by using the comment box below.